The mighty MisterNebÂ® Compressor Nebulizer System is compact, light-weight and portable. Light on its feet (only 3.5 lbs. 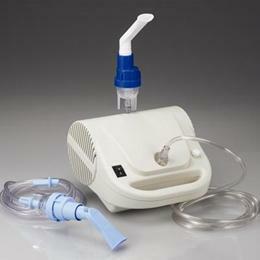 ), this efficient nebulizer is priced just right when cost is a consideration. The SidestreamÂ® disposable handset provides fast drug delivery and shorter treatment times. An ideal alternative to other more expensive nebulizer designs, MisterNeb is guaranteed to do the job and is one tough contender in aerosol medication therapy.